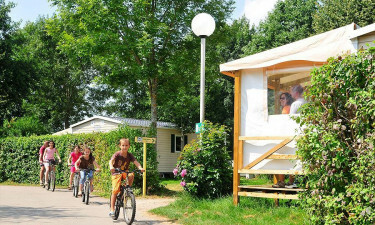 A family-friendly destination, Camping Le Giessen delivers a four-star experience in a charming setting close to the Vosges Mountains. You will be able to enjoy the beauty and culture of the Alsace region while relaxing at this well-equipped luxury camping site. LuxCamp is your destination to book a stay at Camping Le Giessen. 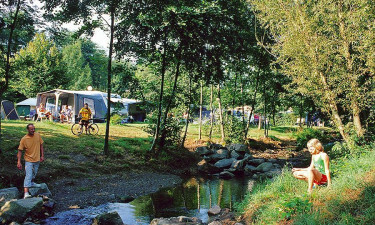 This holiday camping site boasts comfortable mobile homes and spacious pitches in a lush setting in Bassemberg. The remarkable campground is a beautiful base to relax, explore the surrounding landscape, or experience the region’s culture and cuisine. 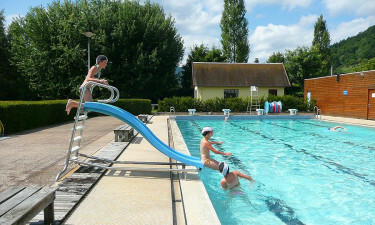 Why Choose Camping Le Giessen? Surrounded by vineyards and medieval villages, you can enjoy the charm and character of Alsace from this rural holiday camping destination. The area around the campground also offers a picturesque backdrop for hiking and mountain biking. The campground also boasts modern and convenient amenities, including superb leisure facilities. Next to this holiday camping site is a stunning water park with indoor and outdoor pools. You have free and unlimited access to the park, which also has a slide and hot tub. Other fun activities close to your accommodation include on-site tennis and volleyball courts, a kids’ play area, and an entertainment marquee. You will enjoy modern comforts of home at this luxury camping holiday destination, including laundry facilities and showers. There is a snack bar serving delicious meals and refreshing drinks. During the summer, fresh bread is also served.